Middle school students complete ANSEP's middle school career exploration academy in Bethel during the week of July 23-27, 2018. It was ANSEP's first middle school career exploration academy held outside of Anchorage. It’s a question we’ve all been asked: what do you want to be when you grow up? To have an answer, you often have to know the possibilities. 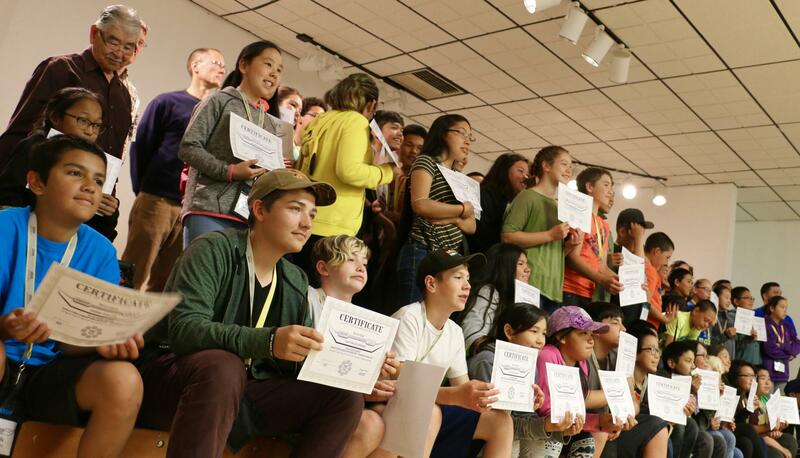 For the first time, Alaska Native students were able to see the range of possibilities within fisheries and wildlife in the Yukon-Kuskokwim Delta through a decades old science, technology, engineering, and math program. "Oh, that's sour!" said Anchorage eighth grader Anna Hyer, wrenching her face. Carrying measuring sticks and calipers, state wildlife biologists taught the students how to calculate the amount of food available for moose in order to estimate the size of the potential moose population and the number that can be harvested. The middle schoolers are the first class to attend a Career STEM Exploration Academy outside of Anchorage with the Alaska Native Science and Engineering Program, or ANSEP. All of the students had attended a previous ANSEP academy in Anchorage, and most of the students are from the region. Scientists from multiple agencies and organizations from around the region participated. UAA college student Kelsey Penaruk is an ANSEP Youth Peer Mentor from Chefornak, a community where people haul water and use honey buckets. She initially majored in civil engineering to help bring piped water and sewage to her community. But after working more with ANSEP and interning with the U.S. Fish and Wildlife Service, Penaruk is changing her major to environmental science and biology. In Bethel, Penaruk cuts salmon as she studies fisheries while speaking Yugtun with elders. ANSEP’s goal is helping students find a career path in a STEM field. Esquible hopes that these students can follow paths to careers leading home to the Yukon-Kuskokwim Delta.